The metabolic functions of an animal proceed most efficiently within a given temperature range that varies between taxa. Endothermic animals raise their body temperatures by metabolizing a high quantity of food relatively quickly; the heat released from the process of digestion raises their temperature adequately. By contrast, ectothermic animals do not digest enough food fast enough to heat their body from inside; instead, ectothermic animals must warm their body via external sources. The temperature range of poikilothermic animals fluctuates with external temperature changes; homeothermic animals typically maintain their temperature within a narrow range. 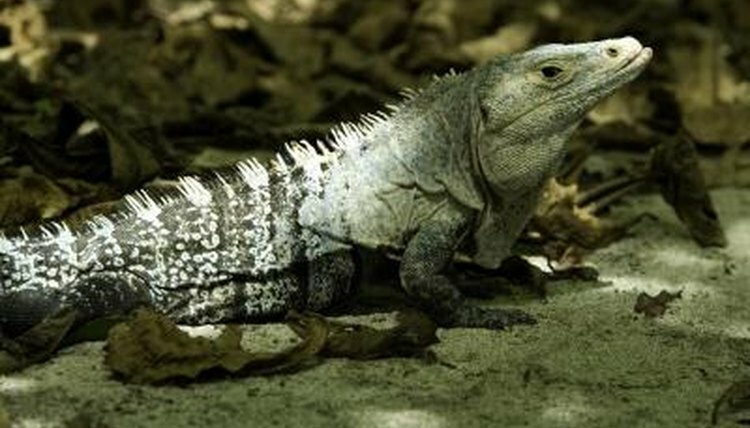 While the body temperature of an ectothermic animal living in the rain forest may fluctuate only a few degrees over the course of a day, the body temperature of one living in the desert may fluctuate more than 20 degrees Fahrenheit, as the nighttime low temperature soars, becoming the daytime high temperature. Homeothermic animals often have fur or feathers to help retain their body heat, while many ectotherms have skins adapted to basking and absorbing heat. The metabolic rate of an organism can proceed along at a relatively constant rate, as with mammals and birds, or it can fluctuate between two extremes, as is the case in snakes and some lizards. This has important implications for an animal’s life cycle. Tachymetabolic species must eat frequently to fuel their metabolic fire, while metabolism of bradymetabolic species fluctuates with available food and other factors. As an example, compare the feeding habits of tachymetabolic grey squirrels (Sciurus carolinensis) that eat throughout the day, with those of bradymetabolic anacondas (Eunectes sp.) that may eat only a few times in a year. The squirrel’s metabolism proceeds at approximately the same rate all the time, while the snake's works quickly while it is digesting food and slowly while it is fasting. Many species exhibit a mixture of metabolic traits, defying categorization as either coldblooded or warmblooded. Both three-toed (Bradypus sp.) and two-toed (Choloepus sp.) sloths are mammals who generally demonstrate warm-blooded traits, but their metabolism is much slower than that of most similar-size mammals, their body temperature remains lower than that of most mammals, and their metabolic rate fluctuates greatly. Accordingly, a sloth is best described as endothermic, yet poikilothermic and bradymetabolic. Some ectothermic animals are large enough that a mechanism called mass homeothermy applies. Particularly large animals' surface-to-volume ratio is such that they can retain enough heat within the body to maintain steady body temperature. Some scientists suggest that leatherback sea turtles (Dermochelys coriacea) provide an example of mass homeothermy, but a 2010 study by Brian L. Bostrom and colleagues showed that leatherback sea turtles actually use behavioral mechanisms to raise their body temperature internally. The data collected by Bostrom and his colleagues suggests that leatherback sea turtles are a rare example of an endothermic reptile species. University of Pennsylvania; Variation in Metabolic Rate between Populations of a Geographically Widespread Lizard; Michael J. Angilletta, Jr.
Byte Size Biology: Warm Blooded Turtles? Nature; Metabolism of Leatherback Turtles, Gigantothermy, and Thermoregulation of Dinosaurs; Frank V. Paladino, et al. Plos One; Behaviour and Physiology: The Thermal Strategy of Leatherback Turtles; Brian L. Bostrom et al. Plos One; Dinosaur Fossils Predict Body Temperatures; James F. Gillooly, et al. How Does an Animal's Size Affect Metabolism?